Generation X, Generation Y (Millennials), Generation Z – they’re the ones driving the future, but how do you drive their spending? Reaching the digital generation takes savvy, creativity and flexibility. Much like the generation itself. Where do you start – or click? Previously, a tactical mix of TV, radio, direct mail, brochures, calls, requests for appointments and newsletters would deliver results. Today, it takes searches and blogs, online research, social networks, a website, a following (on social networks) and reviews or likes (social buzz). How do generations use media? Generation Z (post-millennials) – Who knows what the future will bring? 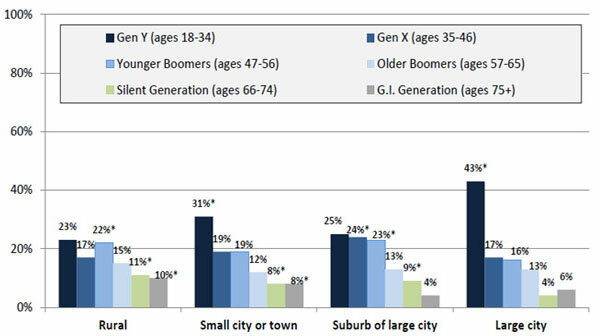 The fact is Millennials dominate large towns and small cities, so we need to know how to reach them. Source: The Pew Research Center’s Internet & American Life Project Local News Survey, January 12-25, 2011. N=2,251 adults, ages 18 and older, including 750 cell phone interviews. Interviews conducted in English and Spanish. Margin of error for the total sample is plus or minus 2.4 percentage points. An asterisk (*) indicates a significant difference at the 95% confidence level. 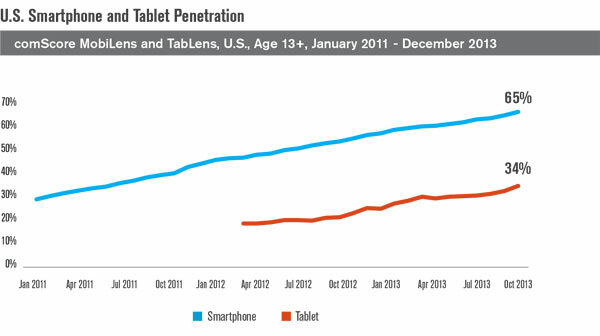 Across all generations, mobile is the game changer – smartphone and tablet penetration has grown by almost two-thirds in just four years. It’s worth including search engine marketing – to the tune of 11.9 billion Google searches per month! Target specific regions or reaches, and reach potential customers at the precise moment they’re looking for information – your information. How does video play? For many Millennials and Generation Z, YouTube replaces TV. In fact, it’s the second largest search engine in the U.S., with more than 3 billion searches each month. And, almost 50% of internet users are on YouTube. It can be an information source to discuss key topics, promote core services, enhance organic search results, reach a younger audience. YouTube gets over 1 billion visitors a month. Want to get the young folks’ ear? We’re tuned in - contact us today: Tony Oedewaldt at tony@mcdmarketing.com or 309-346-6974.